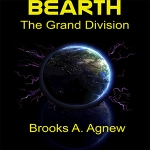 The Grand Division I wrote about in the Bearth Trilogy is happening as we speak. There is a universal mistrust of government spreading over the entire Earth. This has been accelerated by the new neuro-network that has just reached its 20th year of existence; the internet. . The vast majority of the world now knows this to be true. This has caused them to wake up to the information matrix controlling the human race. You and I have pulled the plug. For everyone else, the power of social media and propaganda has created and inflates bubbles of insanity, trapping intelligent people of goodwill in a cycle of ignorance we call the NPC . Tune in. Get squared. Go forth fearless.